The sunset and segways make a perfect combination on this 2.5 hour tour of Washington, DC. Ride around the National Mall to see the illuminated monuments as the sun sets over the nation's capital. 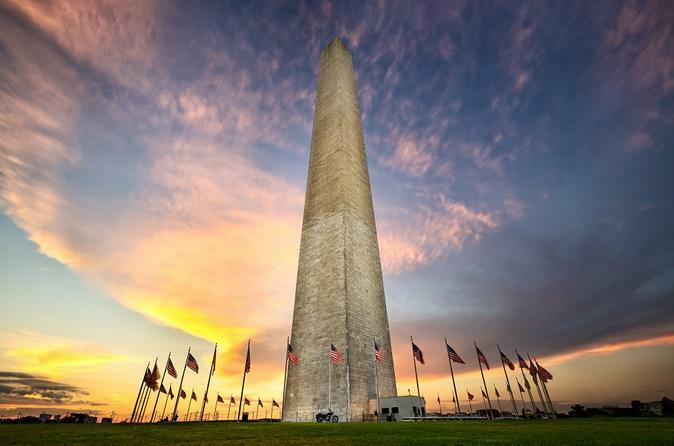 Explore DC on a segway and enjoy incredible views of the monuments and sunset on this unique tour. Arrive at the Ronald Reagan Building on Pennsylvania Avenue at 6:45pm to meet your tour. Receive a quick training session on your segway to ensure your comfort and safety during this 2.5 hour tour. Lean forward and start rolling through the National Mall. As the sun starts to set, pass the Washington Monument, Holocaust Museum and Bureau of Engraving. See the Jefferson Memorial, MLK and FDR Memorial as they are illuminated. Enjoy beautiful views of the tidal basin and the Potomac River on your way to the Lincoln Memorial and Reflecting Pool. Walk up the steps to the Lincoln Memorial then visit the Vietnam Memorial and Korean Memorial Continue on to the World War II Memorial. See the White House as evening falls, as you end your tour. Discover the National Mall of Washington, DC, with a pleasant evening breeze, sunset glaze and less crowds on this unique segway tour.